At PetSmart, toys and pet entertainment has NOT gone to the dogs. As a cat lover, you know cats deserve some fun too! This spring, Pet Smart is launching two great lines of purrrfect cat products from artist Laurel Burch and fashion icon Martha Stewart. Artist Laurel Burch is known for fun, colorful paintings and jewelry. Now, her famous artwork of colorful cats can be seen on cat food bowls, feeding mats and more.These products are available Feb – May on PetSmart.com and in-store. 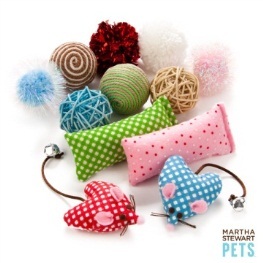 From little catnip-filled mice to feathery fun, Martha Stewart Pets™ has launched a full line of cat products this just for spring, including a Caterpillar Pom Pom Dangler, a Stretchy Cat Toy and an assortment of crinkle toys! All toys come in an assortment of shapes, sizes and bright spring colors that will keep your cats entertained for hours. These products are available January – March on PetSmart.com and in-store. 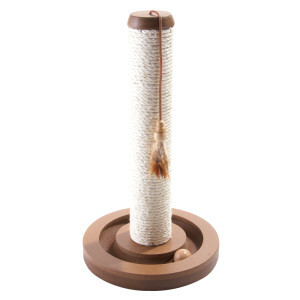 Save your furniture and inspire your cat to scratch and claw with the KONG Cat Track Scratcher. Fibrous and durable sisal covering is perfect for conditioning nails. Sturdy base eliminates wobbling. With 5 cats in the house, my mom really needs to keep her cats busy and out of trouble. PetSmart is the perfect place to come to or to shop online for all their pet needs!